Wow! Those berries are calling to me! Can't wait to try it, I know I'll get to at some point ;) Can't wait to see how the white chili turns out. I've never tried that either. Oh my goodness this looks wonderful!We just got a new spring form pan and what a great way to break it in. Thanks for the recipe! You mean you're supposed to make chili the same every time? Really? I do my cheesecakes like that - try a different recipe each time. In the summer, I like it berry-laced (and am fond of sour cream topping)and then sometimes I like chocolate and other time amaretto and now the only one I will crave (until I make it) is yours! Hi Rosemary, Thanks for your lovely comments on my blog. You made me smile too. I recognise the comment your husband made after scoffing two slices of your pumpkin cheesecake - I have one of those husbands too - I think what they mean is "Honey, this is fantastic, but the one you usually make is even more fantastic." I have never made a baked cheesecake but your tale of two cheesecakes has inspired me to give your recipe a go! I'll let you know how I get on. Fun take on cheesecakes. I have to admit - I have never made a cheesecake. I am not a dessert-maker and certainly not a huge cheesecake fan but even I can appreciate THE best cheesecake in the world! Krista, Alicia, Claudia, Hester, Dimah and Andra -- Thanks for stopping by and commenting . . . would you believe I'm making a cheesecake right now?!?! A friend is having a birthday (cheesecake screams "celebration" to me) and she likes chocolate and peanut butter desserts. So, a chocolate and peanut butter cheesecake it is! My first. I sure hope she likes it! You are so right! People swear by their cheesecake recipes. Unfortunately, I've yet to settle on one...the cakes I've made have always left a bit to be desired. Maybe this recipe will be the one for me! Thanks for sharing, sweet girl. Eat well tomorrow! I love cheesecake have stuck to the same one for over 30 years now, I guess its what you get use to Monet... This one sure looks amazing! Love the photo its gorgeous! Rosemary-What a gorgeous strawberry topped cheesecake. I happen to have the same exact recipe for the cheesecake, except it also calls for 1/3 cup of heavy cream in the batter. Your stacked up strawberry topping sure beats my carefully lined up pieces the way I top my cake. 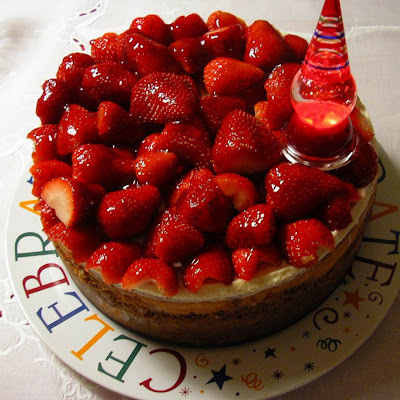 If you gonna use the prettiest strawberries, as on your cheesecake, then mind as well "flaunt" those beautiful berries! Ok I am dying, this cheesecake is drop dead gorgeous!!! My mom has a great cheesecake recipe, but hers never looks that beautiful (and while we all know good looks arent everything, well, they count for something!). You have convinced me to try this recipe!